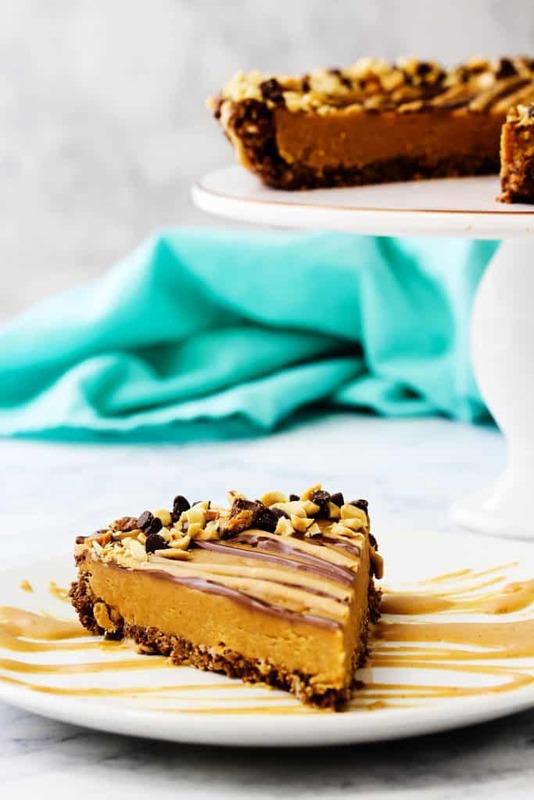 This no bake peanut butter pie with a chocolate rice crispy crust has a rich and creamy filling with a crispy, crunchy crust. 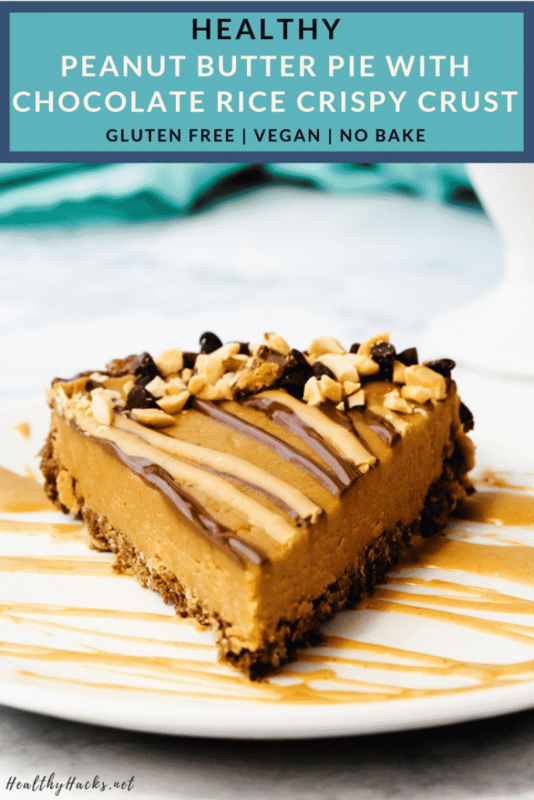 You won’t believe something so rich and decadent is actually low in sugar and only takes a few ingredients and a couple of minutes to make! 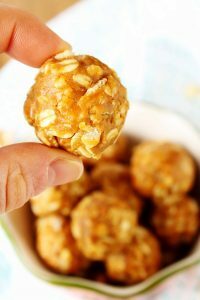 What do you get when you mix peanut butter and a chocolate rice crispy treat? 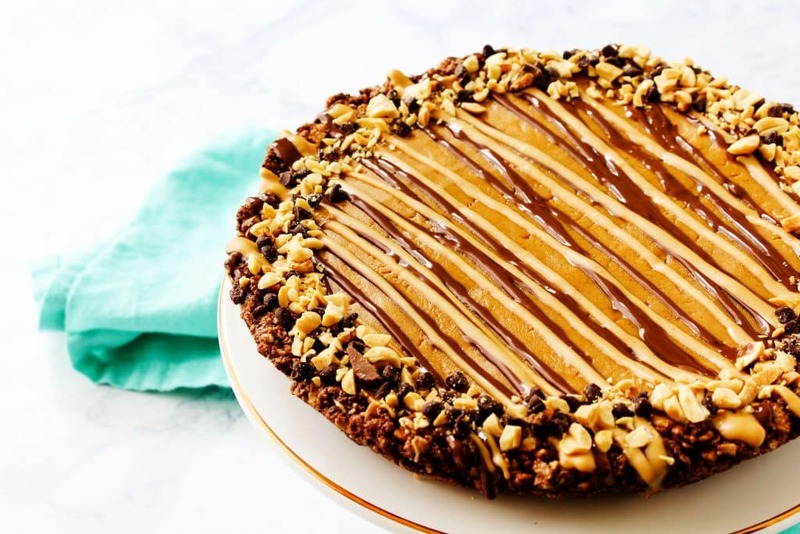 This may sound like the start to a joke, but lemme tell you…this is not a joke – you get this no bake creamy, silky peanut butter pie filling with a chocolate rice crispy crust and a I would never joke about such deliciousness. The second hardest part is going to be getting the pie out of the pie pan. But that’s with any pie, isn’t it!? Easy problem to solve though. Line your pie pan with cling form/plastic wrap with enough excess hanging over the edge so you can use that as a handle to lift the pie out. Even if you plan on serving the pie in the pie pan, I’d recommend still lining it just to make sure nothing sticks. 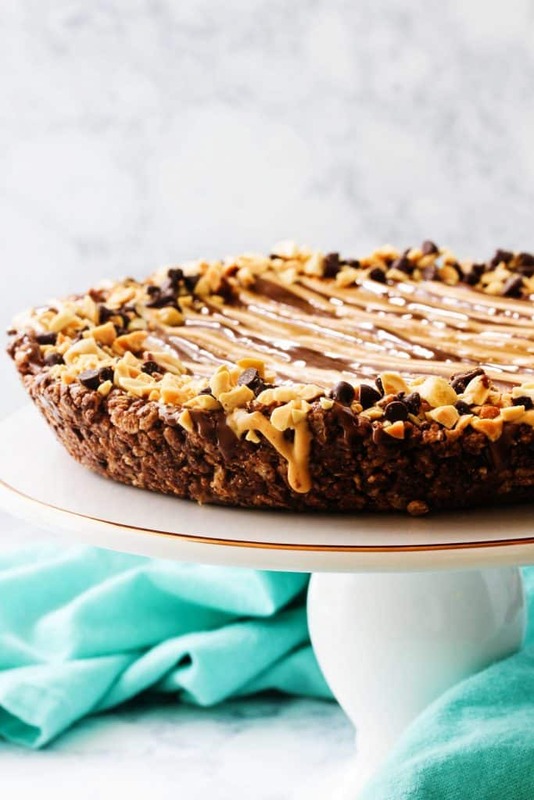 Then just mix up all the ingredients for the chocolate rice crispy crust. 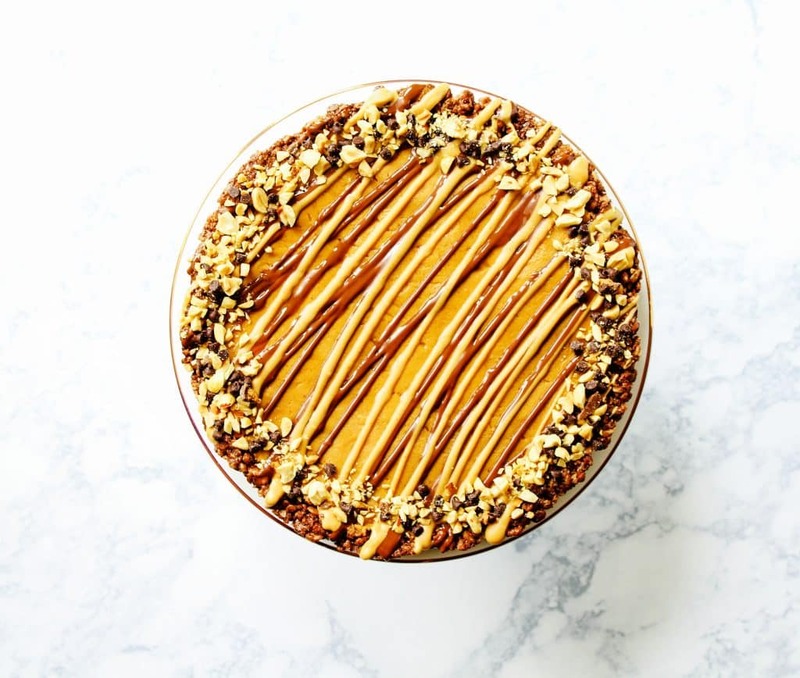 Now that I’m writing this, I’m having a slightly obvious epiphany that you could totally make just the crust and turn it into a crispy, crunchy, chocolatey rice crispy treat. Yummmm! But in this case, press the crust mixture into your prepared pan. You want to make sure it’s smooth and even and while your hands will get the job done, using a cup with a flat bottom to press the mixture together works wonders! Make sure you’re getting some of the mixture up the sides of the pan, too. Because then you get that perfect mix of pie and crust at the last bite. The crust will take a few hours in the fridge to harden. Once it’s firm you can make the filling – the star of the show, in my opinion. And you don’t even need any fancy equipment to make it. 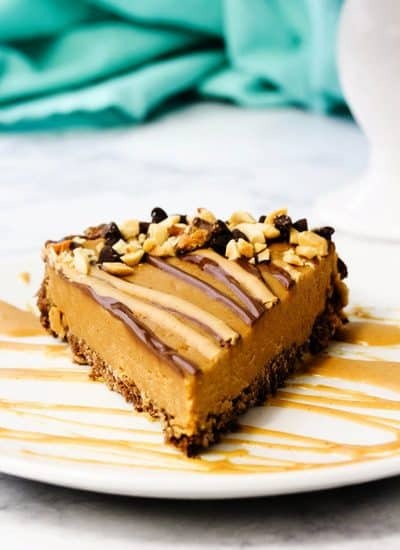 Just a bowl and a spoon and some good ol’ arm strength… and really, not even that much of it ;D . Stir just until everything is smooth and well combined and then scoop it into the set crust. Smooth out the top to make it look purdy and pop it back in the fridge to set up. 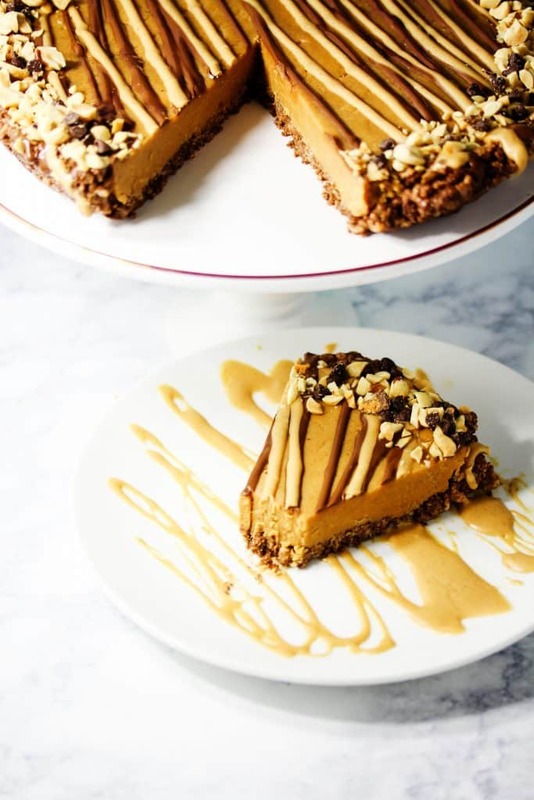 If you are making this no bake peanut butter pie with chocoalte rice crispy crust ahead of time or need to store any leftovers, it’s best to store them in the fridge. The pie will last at least a week in there. You can also eat it straight out of the fridge, but if you want a slightly silkier, softer, creamier texture let it sit at room temp for about 30 min. before you eat a slice. If you can’t find brown rice crispy cereal, you can use regular rice crispy cereal. You can use either dark or regular unsweetened cocoa powder. 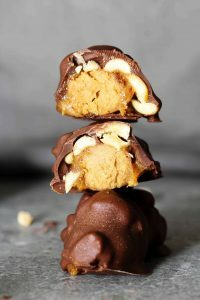 Other readers have had luck swapping out the powdered peanuts for more regular peanut butter in recipes like my peanut butter oatmeal raisin cookies and peanut butter chocolate chip blondies. I haven’t tried it in this recipe to guarantee it’ll work in this recipe, but I think it would. Line a 9-inch pie pan with cling form, leaving enough excess to hang over the edges (to make the pie easy to lift out of the pan). For the crust: in a large bowl, stir together the rice cereal, cocoa powder, sugar, and salt. Add the almond butter and stir until incorporated. Transfer the mixture to the prepared pie pan and press the mixture evenly on the bottom and up the sides. Using a cup with a flat bottom helps to firmly press the mixture together. Place the crust in the fridge for at least 2 hours to firm up. 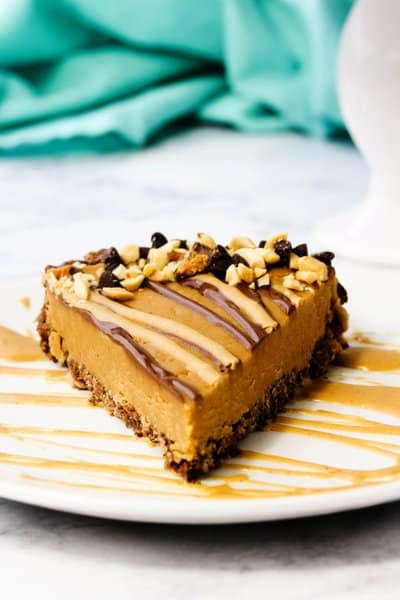 For the filling: mix together the peanut butter, powdered peanuts, maple syrup, powdered sugar, vanilla extract, and salt until well combined. Pour the filling into the firmed up pie crust and place back into the fridge for 2-4 hours until firm. Using the cling form overhang, life the pie out of the pie pan and slice into pieces. Prep time doesn't include time needed to set up in the fridge. Hi! Looking forward to making this for a Christmas dessert, but what is "powdered peanuts"? Powdered peanut butter such as PB2? Thank you! This looks delicious! I can’t wait to make it! Can you share what you used to decorate the top? Thanks! !